About an hour drive from Zihuatanejo, along Mexico’s Pacific coast, you’ll find Playa Viva, a sustainable boutique hotel with an opportunity unlike any other: the chance to stay in an ultra-modern bamboo treehouse. Expect to be dazzled by the unobstructed ocean view. The 700-square-root cylindrical treehouse comes complete with a king-size bed, bathroom, open-air shower, and even an in-floor hammock. Keeping its footprint as light as it looks, electricity and hot water are generated with solar power. We’ll race you there. As an East Coast native, Sari Lehrer had one opinion when it came to backyards: “They should be flat expanses of rolling green lawn.” Her husband, Eli, born and bred in L.A., believes the exact opposite, as a fan of cantilevered patios, steep slopes, and raw edges. Enter landscape architect Sam Gore, who helped them meet in the middle. A big believer in encouraging her children’s imaginative thinking, Lehrer was especially insistent on creating a backyard full of safe play spaces, where the kids could feel like they were off doing "wild, illicit activities, but they’re not actually in any real danger, so I’m not actually having a heart attack,” she says. ("You haven't known fear until you've watched a beginning walker try to navigate a five-foot concrete drop.") 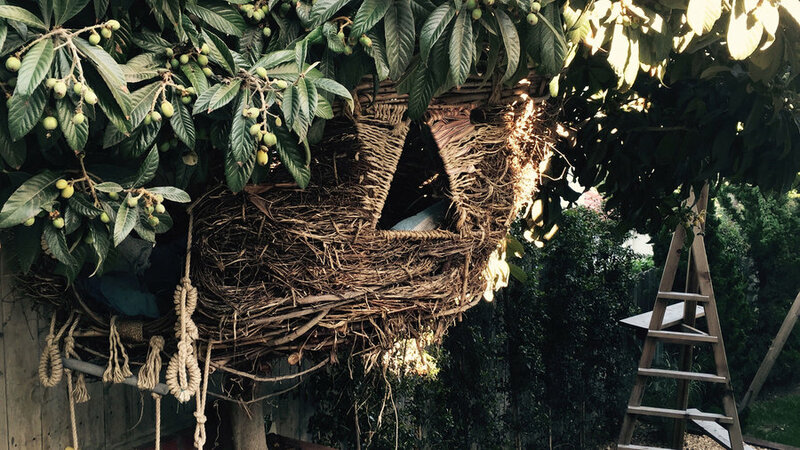 Her yard includes willow tunnels, stumps-turned-stepping-stones, and this: a gigantic willow nest, perched in a loquat tree overlooking Silver Lake, made by Dylan Hostetter and Didi Beck. A secret spot full of hand-sewn cushions and hanging jewels, complete with look-outs and peep holes, "The kids feel like they're floating in mid-air," Sari says. "This feeling freaks me out. But, for them, it's pure magic." Head to the Pacific Northwest to enjoy the magical grounds of Treehouse Point. 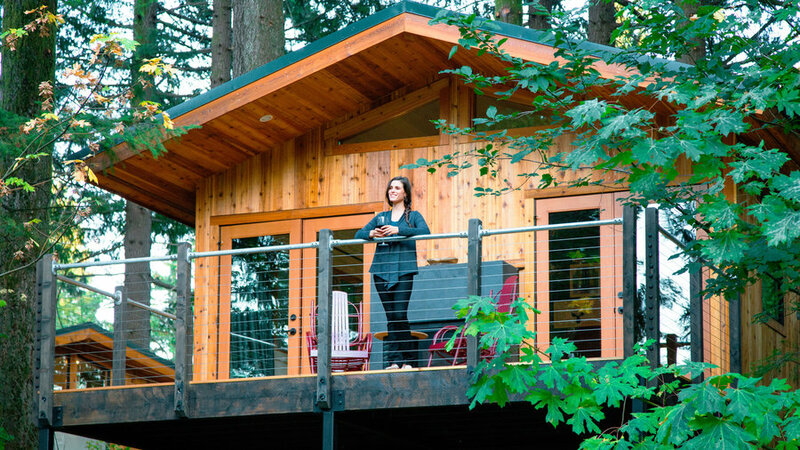 Situated in lush forest of Fall City, Washington, this retreat center is home to six different treehouses–each crafted by world-renowned treehouse builder and author Pete Nelson. These incredibly, inventive designs come with well-kept living and sleeping quarters, as well as ground-floor bathrooms and a communal dining and lounge areas within the Main Lodge. Sleep in the sweet spot between the clouds and the forest floor of the Columbia River Gorge on the Washington/Oregon border at Skamania Lodge’s two cabin-style treehouses, designed by architecture firm MG2. 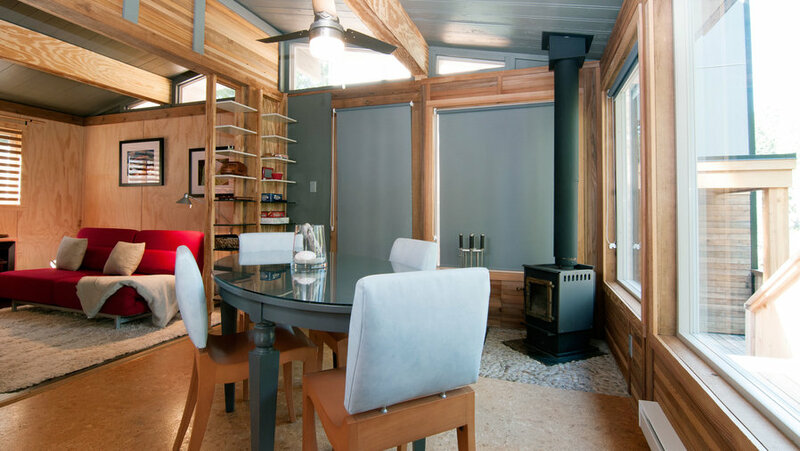 Cedar walls and an indoor-outdoor fireplace give them a modern forest feel. Their location, 20 feet in the air, makes for stellar owl’s-eye panoramas, and the property has 4 miles of hiking trails and a zipline (for those craving even more tree time). Maybe our 9-year-old selves had it right: All you really need for a happy existence is a little backyard treehouse. 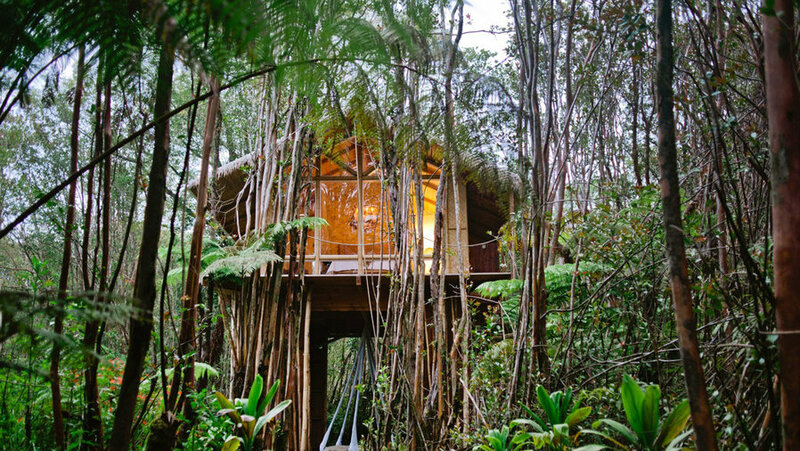 You can test that fantasy in this real-life (adult-size) Airbnb rental in the rain forest of the Big Island. (You even enter the dwelling through a trap door!) Built by minimalism enthusiast Kristie Wolfe and her mother, this dreamy tropical treehouse resides 15 feet up in the canopy of local flora and features a wraparound lanai (with, yes, 360-degree jungle views). And just like your childhood play structure (though much more modern), this treehouse is entirely off-the-grid: the space features solar power, a rainwater-catchment system, and optimized natural light through windows and sliding glass doors. With elegant bamboo accents, hanging lights, tropical views and total seclusion, it’s no wonder 90% of guests are honeymooners. 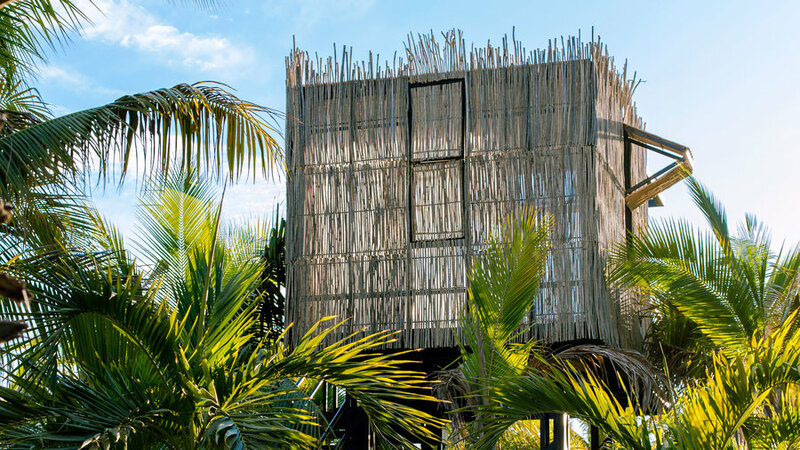 The dozen thatched treehouses at San Jose del Cabo’s Acre (pronounced ah-cray) resort soar 15 feet into the palm-forest canopy, high enough to see the entire 25-acre farm they’re perched on. Using the surroundings for inspiration, the palapa-style rooms are made from the property’s stock of palo de arco trees; each has a terrace shower with views of the Sierra de la Laguna Mountains. When you’re not lounging amid the leaves, the on-site bar is the spot to mingle over Mexico-centric cocktails. 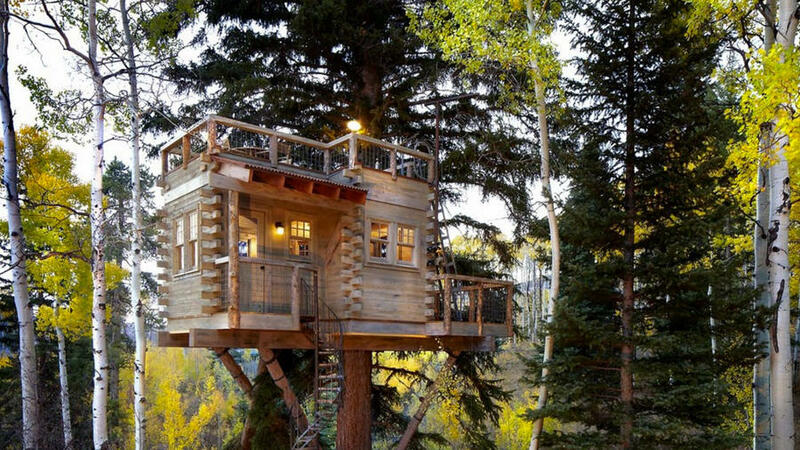 Colorado architect Missy Brown takes the cake on adult-friendly treehouses, as in way too cool to just be for the kiddos. Anchored to a 90-foot-tall spruce tree, this tiny dwelling includes a spiral staircase, open living space, kitchenette, writing desk, and even a rooftop patio. British Columbia’s best-kept secret is its Sunshine Coast, a rugged 100-mile shoreline laced with bays and inlets. The best place to cozy up is high atop a craggy fjord at the Secret Cove Treehouse, a knotty-pine dwelling with radiant-floor heating and picture windows with vertigo-inducing views cascading down to the placid cove below. Revel in it with an in-room massage, soak in the moonlit hot tub, or amble to the private dock stocked with canoes. The property’s two treehouses can be booked in tandem for bigger groups. 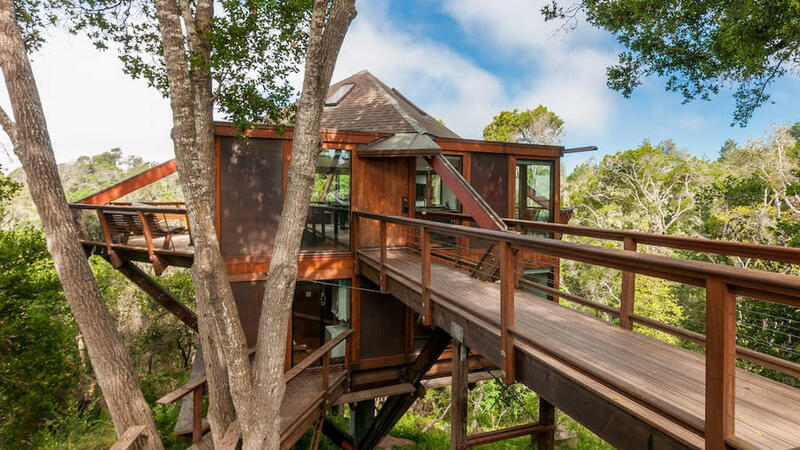 Though it looks futuristic, this Aptos, CA treehouse is over 50 years old, built by architect Ronald Haas. The entire weight of the house is balanced on a single cement pillar 30 inches in diameter and that's buried 35 feet into the ground. The exterior is teak and copper, with supporting structural beams of redwood. The interior is full of black walnut, mahogany, cedar, rosewood, and teak, with bamboo floors. Current owner, Sam Odio, bought it to be a retirement home for his parents. Until they move into it, he rents the 1,200-square-foot (split over two floors) dwelling to guests via Airbnb. Outfitted with the latest smart home devices, this getaway will be the perfect mix of treehouse magic and without sacrificing any of your creature comforts. We’re sure you’ll have plenty to look at (the ocean is visible and the windows run floor to ceiling), but just in case you get antsy, you’re a mere 8 miles from downtown Santa Cruz. 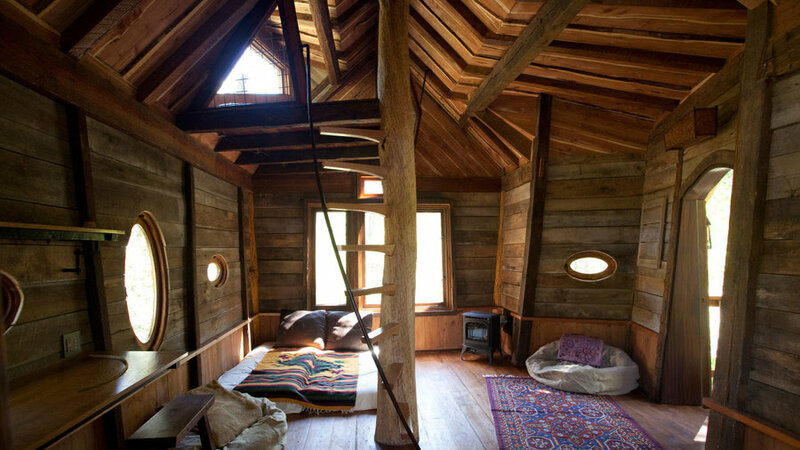 In 1998, contractor and treehouse builder Doug Studebaker began constructing this whimsical, sky-high retreat. Over the past four years the treehouse transformed from a kid-friendly slumber party spot to a vacation destination. 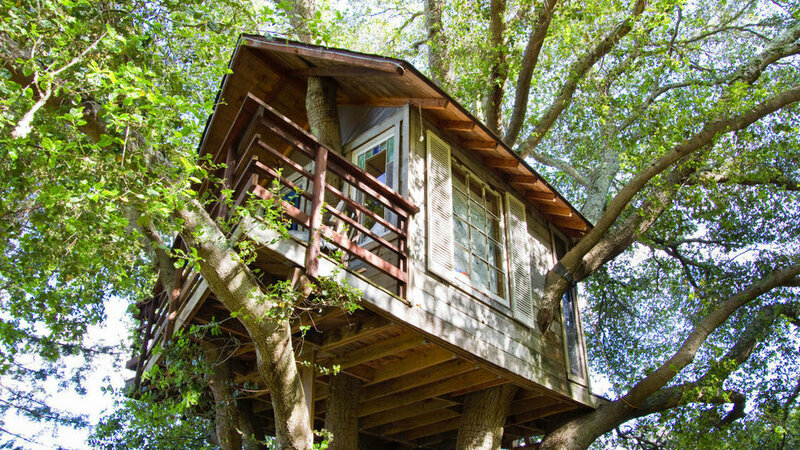 Nestled into a majestic coastal live oak, the Studebakers’ treehouse harbors two beds, sleeps four people, and also features a rope swing and wrap-around deck, where guests can soak up views of the bay. 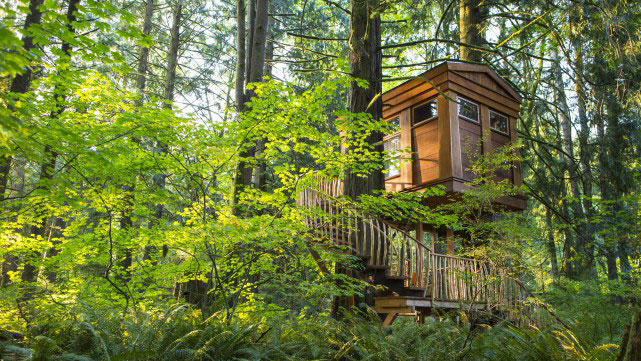 Just 20 minutes from San Francisco, Doug and his wife, Linda, have hosted guests from all across the world, offering a unique, urban forest experience via Airbnb. The Crystal River Treehouse may not be technically housed in a tree, but it’s pillared, forested location makes it a worthy treehouse in our book. David Rasmussen and Steven Novy of Green Line Architects constructed the creative structure in Carbondale, CO. The mini house is decorated with multiple beanbags, lounge chairs, and a floor-bound bed with a range of windows from which to enjoy the view. Unfortunately, the space isn’t available to guests, but given its one-of-a-kind character, it’s worth a momentary marvel.